By volunteering your time, you automatically become a member of Andover Trees United. We encourage all members to contribute to decision-making and play as active a part in the running of the charity as you are able to. There are no membership fees. 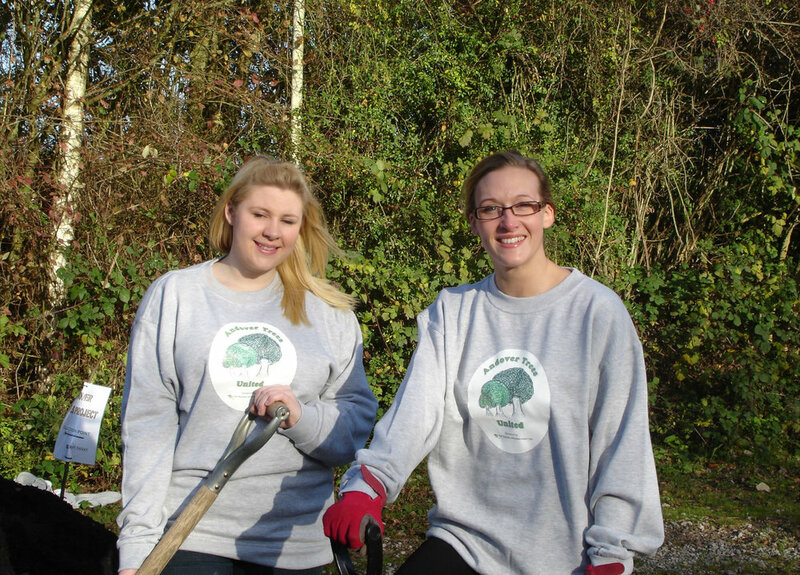 Volunteering with Andover Trees United offers people the chance to make a difference in the local community. Not only does it enable you to tend to the wood, raise and care for trees and wildflowers that will be planted there and get involved in events but it is also a chance to meet new people, learn new skills and give time to others. 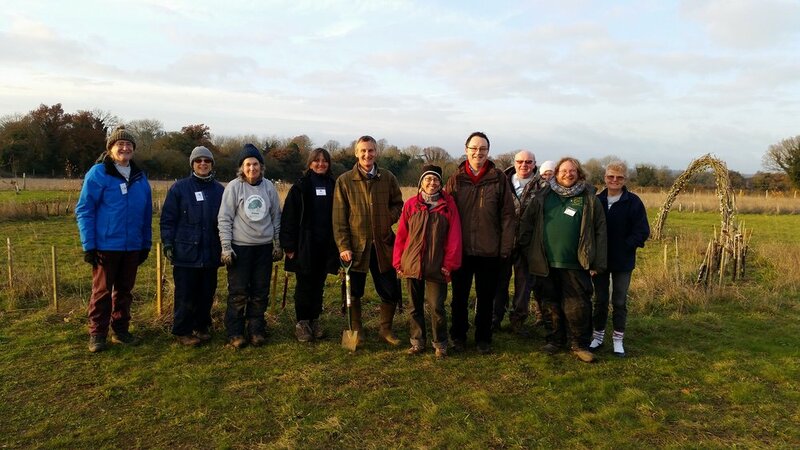 Regular volunteers find they experience improvements to health and wellbeing as a result of working outside with nature and undertaking physical activity. New volunteers often have no experience of gardening growing and are supported by other volunteers. There are many ways to get involved in our work. To talk to one of the team or to express an interest in volunteering with Andover Trees United, please visit our Contact page. We welcome volunteers with many different skills, not just gardeners and growers. Skills can range from: event organisation, art and design, wildlife surveyors, outdoor learning, legal knowledge, photography, plant propagation, financial and fundraising knowledge, musical interest, conservation, accountancy, leafleting, office skills and DIY and construction skills. At the allotment, we look after surplus tree whips between planting seasons and raise trees and wildflowers from seed. In the wood, routine tasks include beating up (replacing tree whips that have died), mulching, replacing lost number tags and carrying out essential repairs. In schools, we help to maintain nursery beds, often supporting teaching staff and their pupils. Typically, practical workdays are held on the second Saturday of each month, craft sessions being on the fourth Saturday of the month. Details for each event, dates and locations may be found in the Events Calendar. Typically, the last 2 weeks in November and coinciding with National Tree Week, is when the majority of new planting in Harmony Woods is carried out. Around 1000 children from schools across Andover and local villages bring their trees to the wood and many volunteers are needed every day during both weeks to help with planting, refreshments, managing tools and all the small tasks that help the day run smoothly. A butterfly transect across Harmony Woods has been registered with the Butterfly Conservation. We are keen to welcome new recorders; training and induction is given, materials are provided and all ‘butterfly walkers’ are included on a rota. Your commitment would be to find an hour once every 4-6 weeks between April and October to walk the transect, to record your findings and to submit them at the end of the season. If you would like to help monitor the growing butterfly population in Harmony Woods, please contact Graeme Davis using our Contact page. We are happy to hear from local companies who wish to volunteer with Andover Trees United. We can offer challenges at all times of the year and tailor activities to suit the size of your group. On each site, there are several tasks to be completed and individuals are able to work in areas of interest or skill. We can provide either half or full day challenges as well as extras such as lunch or an end-of-day massage. We are happy to come and brief the team at your workplace prior to the event. Ideally, we would like a month’s notice to organise the session. We are particularly keen to welcome you to school planting fortnight sessions in late November/early December.